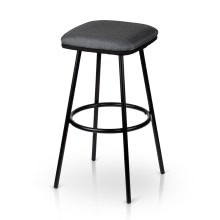 This is a contemporary bar stool for bar, pub, kitchen and counter. Sturdy metal frame, powder-coated surface, thick padded seat for comfortable and durable seating. 2PCS a set, don&apos;t hesitate to buy! Powder-coated metal frame, sturdy for use. Ramie cotton cover, foam padded for long time comfortable seating. Round footrest to put your feet when seated. Saddle-like design, fashion for bar, counter, kitchen etc. 2pcs a set, high cost effective.